Gifting a special dining experience is a wonderful gift idea and can be shared and enjoyed by anyone for all occasions. Feel rest-assured that your loved ones will be well-taken care of by our Jano team while they venture through our progressive dining menus. 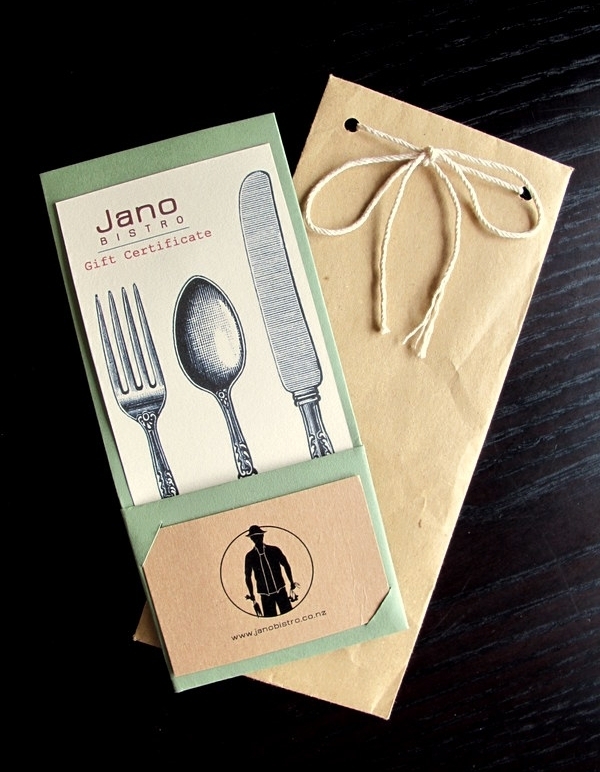 Handmade and designed by us, these are well-presented and come with it’s own envelope. Purchase onsite (Wed - Sun 12.30pm - 8.30pm) or via internet banking to have it posted (NZPostCourier $6.50 - $9.50) - contact us here. * Vouchers are valid for a certain period from date purchased and are non-refundable, non-redeemable for cash, and non-transferable. Vouchers can only be redeemed once and should be used in full as no change of unused balance will be provided.Vouchers are treated like cash and no replacement will be provided for any gift voucher that is lost or stolen. Gift Voucher transactions online are purchased via a secure banking partner (Stripe) and we do not have access to the full credit card number. * You may be required to produce proof of identification at the time of redeeming your Gift Card. If you are unable to provide identification, we may elect to not accept the Gift Card as payment until you are able to do so. * Please allow 2 working days for payment to clear after purchase before we post out the gift voucher. We post via NZPostCourier (non-sig required) which costs $6.50 (urban) and $9.50 (rural) and accept no responsibility for any vouchers lost or delayed by the courier service. * You ensure that you have provided us with the correct postal address and postage option. No replacement voucher will be provided if you give us the incorrect postal address or postage option. * Please allow up to 24 hours after purchase before PDF voucher is sent. * You ensure that you have provided us with the correct email address - no replacement voucher will be provided if you have provided us with an incorrect email address. * Online transactions must be made within Australia, New Zealand, The United States or The UK to be valid. * We respect your privacy and will only use your contact details in regards to your purchase. Your email will only be added to our newsletter mailing list if you have opted to do so when completing our form.